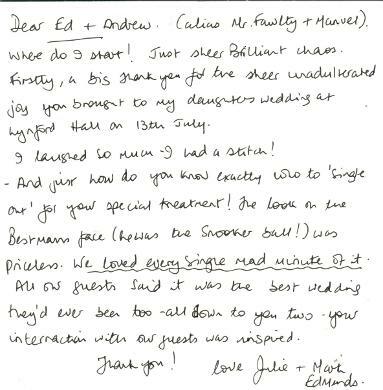 Your wedding day is one of the most memorable days of your life, and to ensure your guests are entertained, and remember your wedding for all the right reasons, it's vital you choose the right entertainment. 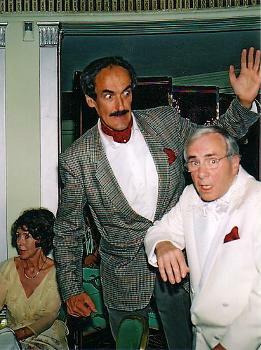 The Fawlty Towers wedding entertainers, Basil Fawlty, Sybil and Manuel, are pleased to quote for who, what, where, and when ever, for a real wedding icebreaker. See: Wedding Entertainment Ideas. 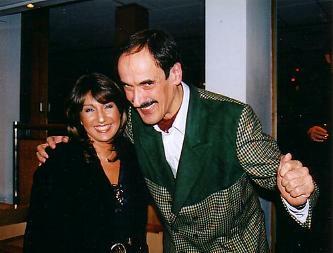 Left- Working with Andrew Sachs, the real "Manuel" at the Dorchester hotel, London. Below- (Don't tell Sybil, that's Jane Mc Donald)! 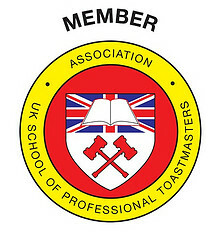 Equity member- £10,000,000 Public Liability insurance- Member of the Association for the UK School of Professional Toatmasters. Click map below to see your home place, and anyone else who's visited, or online. 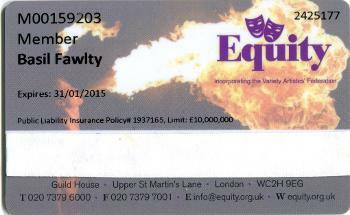 Includes: wedding entertainment Norwich and London, and comedy wedding entertainment ideas Essex and Hertfordshire.